View the current ski conditions by clicking on the links opposite. Please note that we are on Mountain Standard Time (GMT-7 hours) with the exception of Whistler Blackcomb. Whistler Blackcomb is on Pacific Standard Time (GMT-8 hours). See what the weather in Banff is like by clicking on the image below. 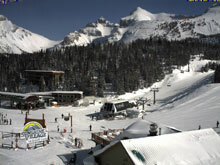 The live mountain cameras have been collected by Canada-Ski.com. Please return to our site when you are finished viewing.